Callum Elder celebrates the first Football League goal of his career. Photo: Joe Dent/theposh.com. Peterborough United’s on loan left back Callum Elder has passed the credit for his own excellent form onto manager Graham Westley and his assistant Grant McCann. Elder (20) scored his first Football League goal - in his 33rd appearance - in Saturday’s (October 24) 4-0 League One win over Doncaster Rovers to cap an outstanding individual display. 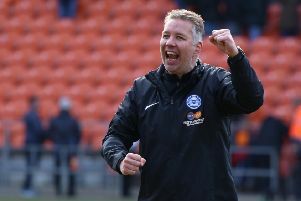 The Leicester loanee revealed that the Posh dressing room is a very happy place right now as they close in on the League One play-off places. Posh are 10th, but only three points off a play-off place, ahead of Saturday’s (October 31) tough trip to fourth-placed Coventry. “It was a great feeling to score my first goal,” Elder said. “It’s taken me over 30 games so I was due one and there’s no other feeling like it when you see the ball finish in the back of the net. “But i have to give the credit to the manager and to Grant McCann. They have encouraged me to affect the game further up the field. They have given me the freedom to express myself. They want me score and create goals and that’s fine by me. “The midfield diamond system suits the way I like to play the game. It gives me the space to join in the attacks and I’m loving evry minute of it. “To be honest I’ve enjoyed it from the minute I arrived here. The lads made me feel very welcome from day one and it is a very happy dressing room at the moment, We are enjoying our football. “The lads have found their self-belief and confidence and we know that if we get everything right on a Saturday we can put any team to bed. “But we are not complacent. The first thing we do every week is work on the mistakes we made in the previous game and try and put them right. “We are playing great football and scoring goals, but we must also work hard off the ball in every game if we are to be successful. “The next challenge is Coventry away and we are not looking beyond that, but our next step is to string some wins together. We want to develop a winning habit. Elder’s existing loan deal expires in January. He has made 12 appearances for Posh having played 21 times in League Two for Mansfield last season.